Any thought of law school vanished the moment Ferrin Bujan stepped into a classroom as a student teacher. It was her last year at Queens College, where she was majoring in math and education, and she had been a little uncertain about her future. Ms. Bujan, 24, is now in her third year teaching ninth-grade math at Brooklyn Community Arts and Media High School in Fort Greene. It is not an easy job: she gets up before dawn so she can be at school early, spends the day teaching, then goes home to grade papers and do her own homework for the master’s degree she is pursuing in special education. She teaches on Saturdays and during the summer. Even her social life revolves around other teachers. -David Gonzalez, The New York Times (April 12, 2013). Ferrin drives to work at 5:30a.m. She lives in Bedford-Stuyvesant, Brooklyn, but until a few months ago commuted from Queens. Before heading to work, Ferrin Bujan, 24, takes a moment to braid the hair of Sakeem Nelbett, her boyfriend. The couple met at Brooklyn Community Arts and Media High School where Ms. Bujan teaches. Mr. Nelbett now works at a high school in Bushwisk. Ms. Bujan prepares the day's lesson in her classroom at 6:30 a.m. Though school does not start for another two hours, she relishes the quiet time before the students arrive. 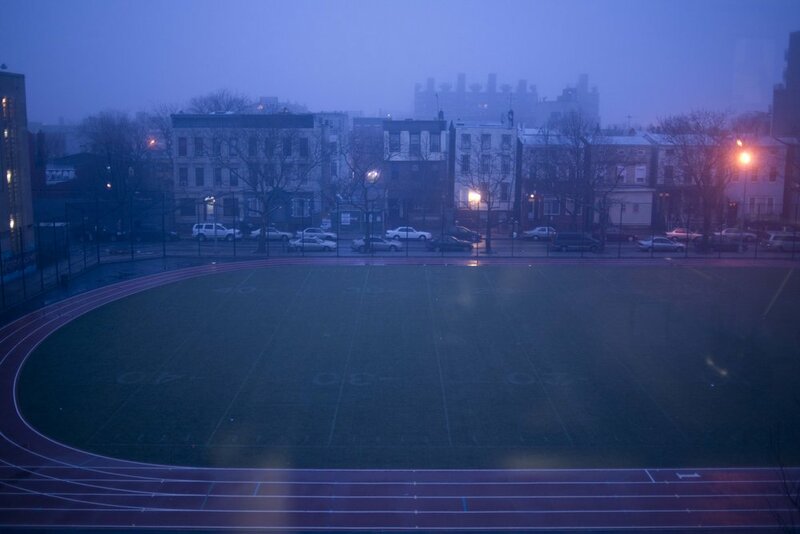 A view of the school's track from Ms. Bujan's classroom window at 6:30 a.m.
Ms. Bujan tries to gain control of her class as the dismissal bell rings. Sari Price, left, a ninth grader, and Ms. Bujan joke during lunch. Many students skip lunch to sit and talk with Ms. Bujan. She says it can be difficult to act as an authority figure because she is so close in age to her students. Ms. Bujan ejects Nathaniel Benjamin from class for being disruptive. Denyse Murray, left, the school's guidance counselor, talks with another student in the hallway. Unruly students are a daily hassle. Ms. Bujan's class rushes to leave as the bell rings. Keeping students engaged is a constant struggle for Ms. Bujan. Ms. Bujan jokes with Rasaiah Williams, a ninth grader, after class. Lenasia Roper, a 12th grader, and her fellow cheerleaders take out their phones after a performance at a boys' basketball game at Brooklyn Community Arts and Media High School. Ms. Bujan reacts after a student makes a rude comment to her in the stairwell. Mr. Benjamin peers into Ms. Bujan's classroom after being ejected for being disruptive. Much of Ms. Bujan's day is spent managing students' behavior. "It's not my job," she said. "I'm here to teach." Jahlil Grant, right, and Charles Roberts, center, use their lunch break to receive extra math help from Ms. Bujan. Ms. Bujan instructs students in a roundhouse kick during a self-defense class she also teaches. She has been practicing martial arts from a young age. 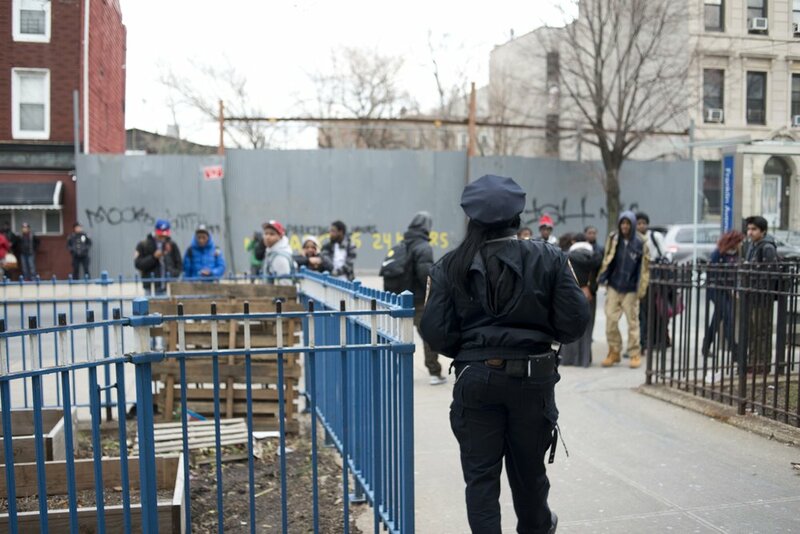 A police officer stands watch after school is dismissed. Ms. Bujan checks the sign-in list for parent-teacher conferences. Fewer than half of her students' parents or guardians showed up. Ms. Bujan attempts to grade papers as her boyfriend distracts her. 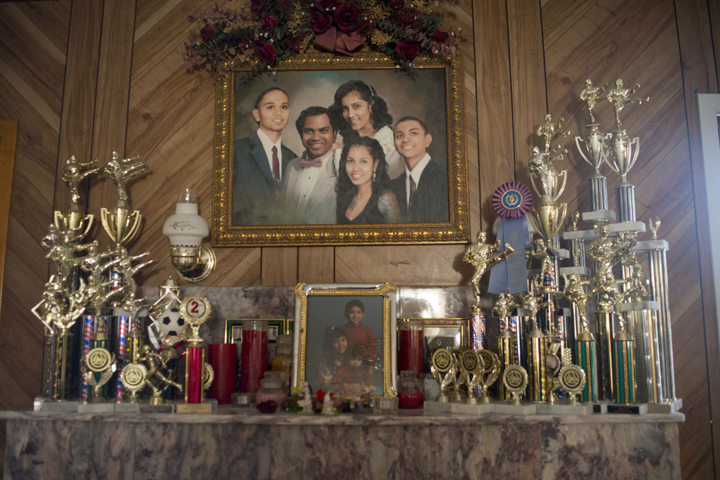 A family portrait of the Bujan family hangs above the mantle in Ms. Bujan's parents house in Queens, NY. The mantle is covered with martial arts trophies Ms. Bujan and her two brothers have won over the years. Ms. Bujan by the piano at her parents' house in Queens, NY. Her parents are West Indian, from Trinidad. She recently moved out of their house into her own apartment in Brooklyn. Ms. Bujan goes to the orthodontist to get her braces removed. Ms. Bujan paints her nails in the car on her to meet some friends for a night out. 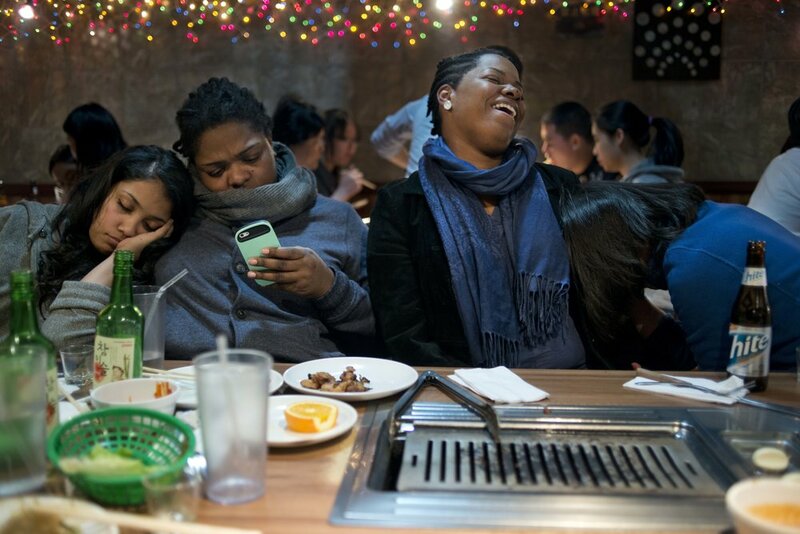 Ms. Bujan fell asleep on Lawanda Greene, Dean of Students and a 12th grade math teacher. Lantonia Coston, the assistant principal, second from right, and Jill Lee, an English teacher, carried on.